The event has grown from very humble beginnings 5 years ago with just 10 stalls and a hundred visitors, to the major North Norfolk Coast event that now welcomes some 10,000 visitors to Burnham Deepdale. 2013 will be the biggest market we’ve run, welcoming almost 80 stalls, mainly Norfolk producers of presents, decorations and lovely food & drink. You won’t find a better place to start and possibly finish your Christmas shopping, with plenty of inspiration from both the stalls and the permanent shops of Dalegate Market. 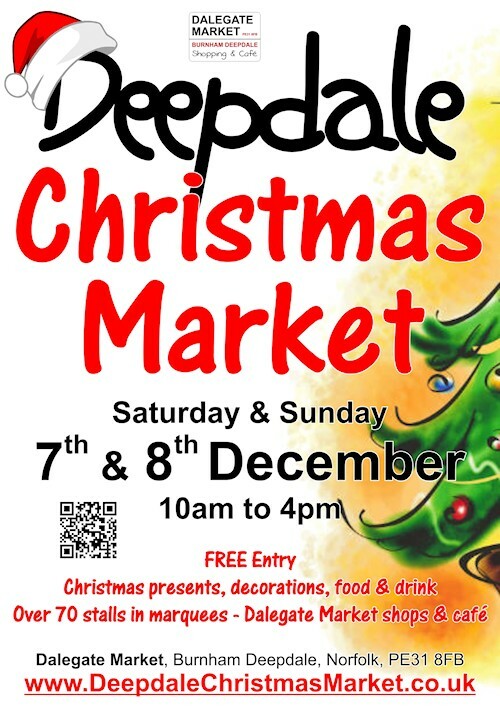 It’s FREE to visit the Deepdale Christmas Market. There is both off street and on street car parking and the Coasthopper bus stops right outside the market. Burnham Deepdale is approximately half way between Hunstanton and Wells-next-the-Sea on the A149 coast road and just over the hill from Burnham Market. This year the Dalegate Tent and Walkway Tent will be in place as normal, filled with great stalls and surrounded by a selection of outdoor stalls. The three really big changes have got us excited. People only discovering Deepdale Christmas Market this year will enjoy their first visit. We also know our loyal visitors will love the mix of our favourite regular stalls and the new additions. Returning favourites include Brancaster Brewery with their thirst quenching selection of real ales, the always delicious Chocolate Deli, Phoenix Trading with their cards and wrapping paper, great ideas for your home from Bringing The Outside In and of course James Buttifant’s penguins. Our new stalls will definitely add to the shopping experience. Personalised jewellery from Beach Hut Charm, wonderful retro creations from DB Craft Creations, Asta Potteries funny chickens, tipples from Norfolk Sloe Gin and The English Whisky Company, demonstrations and bespoke work by Westfield Forge. We look forward to welcoming you to Dalegate Market and the Deepdale Christmas Market on Saturday 7th & Sunday 8th December for a great festive weekend with a lot of Christmas shopping!